Are you satisfied with your life the way it is? For all intents and purposes I have a pretty awesome life, but I’ve spent many years feeling dissatisfied. Much of my thirties have been whiled away yearning to be married with children. This has left me with what has, at times, felt like an un-fillable hole…until now. I have not yet met the man I will marry and I do not yet see children in my foreseeable future. Yet, something has shifted. I have changed my outlook. I’m finally willing to let go. Releasing my dream doesn’t mean I’m giving up, it just means that I’m making a conscious decision to see where life takes me. Rather than focus on lack, I’m seeing potential. There is so much in my life for which I’m grateful. And, right now I’m filled with such enthusiasm for the new projects and ventures I want to tackle that I feel complete. 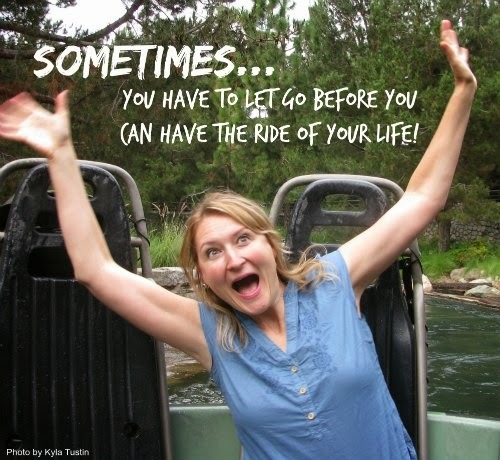 Letting go can take days, months, sometimes even years. It requires a complete overhaul in thinking and a shift in perspective. Letting go isn’t something you can force. If there’s something you’ve been yearning for but haven’t yet been able to manifest or release. 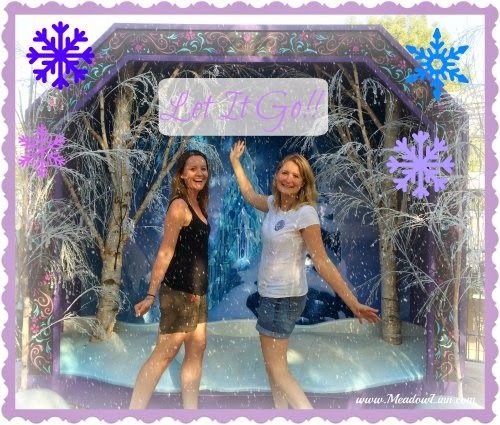 You’ll know when the time is right to let it go, if that’s the best course of action for you to take. And once you soften your grip, you’ll likely feel lighter and freer. For me, getting to this place has been quite a journey. The transformation that I now feel started last spring when I was in bed for two months with whooping cough. When I eventually awakened from this chrysalis and began to spread my wings, I became filled with renewed vigor and excitement for what lay ahead. Job opportunities began flooding in and my creativity started to flow like a rushing river. This alone, however, may not have been enough to loosen my grip on this particular dream. There was something else that played an important role in bringing me to where I am today. During a conversation with a friend who has chosen not to have children, I had an epiphany. I can choose to be single, rather than feeling like it’s happening to me. There are actually a lot of perks to living on my own. And, when I look over my life, so much of what I’ve been able to do, see, and become is not in spite of being single, it’s because of it. This doesn’t preclude becoming a wife and mother sometime in the future, but it does help me gain perspective on the many blessings in my life. Rather than lamenting my status as childless, I’m going to welcome the fact that I am, for the moment, childfree. Just four tiny letters, but the feeling between the two is vastly different. Try this affirmation. The more you say it, the more you'll feel it. I feel such optimism and enthusiasm for what the New Year will bring. I plan to start writing my next book, make headway on some big projects I’m cooking up, and perhaps even move to a new city. With all these ideas percolating and all this gratitude for the experiences I’ve had, there’s little room to feel that my life is lacking in any way. Getting married and having children would be a dream come true, but I have released this to the Universe and am looking forward to what life portends whether or not this comes to fruition. What are you yearning for? A relationship? A baby? A new home? A promotion? Expansion of your business? Increased abundance? You might not be ready to do so today, tomorrow, or even next month, but when the time is right, consider letting it go. Put it into the hands of God/Creator/Universe/Spirit (whatever you call the Divine), and see where the journey takes you. In cooking, just as in life, sometimes we have to let go. Last night I was a busy bee testing gluten-free, grain-free, dairy-free, and sugar-free variations of my great grandmother’s persimmon cookies. Midway through, I made a surprising discovery. When I pureed the persimmon pulp with dates and coconut oil, the result was a luscious, creamy curd. I’d been so set on making the cookies that I nearly didn’t take the time to recognize the deliciousness of this new creation. It would have been easy to soldier on toward my original goal, but instead I decided to let go of creating the “perfect” cookie recipe in a timely fashion, and instead I welcomed this unplanned taste sensation. I’m so glad that I did. Once you try it, you’ll want more! *If your persimmons are still a few days from being ripe (squishy and nearly translucent), you can expedite ripening by putting the whole fruit in the freezer overnight. When the fruit defrosts, it will be soft enough to use. Soak the dates in warm water until soft. This will take an hour or two. 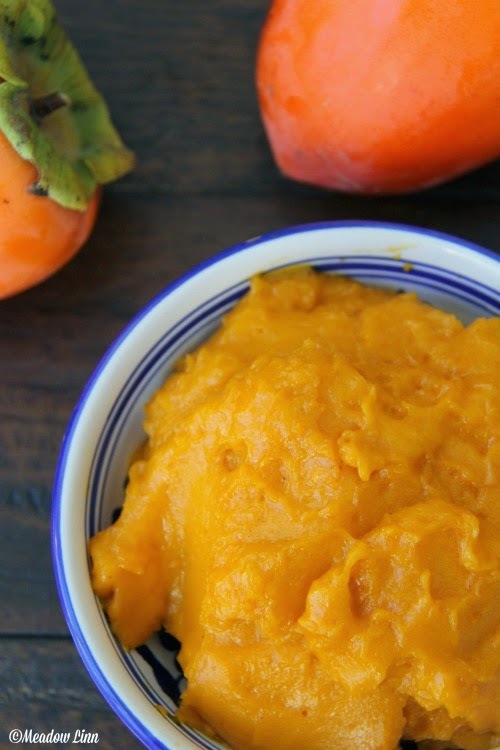 Scoop pulp from your persimmons until you have one cup. When the dates are soft, remove the skin (if you can) and the pit. 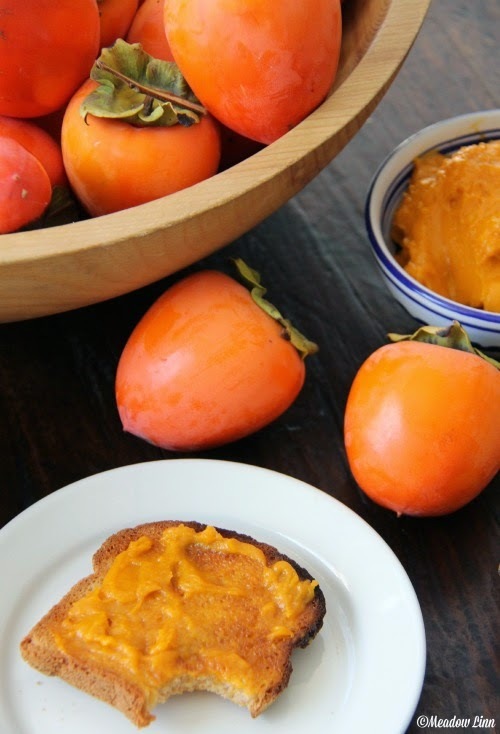 Put the dates, persimmon, and coconut oil in a blender. Process on high until a smooth curd-like texture is reached. Enjoy on toast, pancakes, or anywhere else you might eat curd. Mmm!! !